HURRICANE — After a long discussion and a motion that did not have enough votes to pass during the previous meeting, the Hurricane City Council approved a motion Thursday for city residents to participate in mandatory curbside recycling. Councilman Darin Larson opened the discussion by saying he would rather have an opt-out option; but if it is easier, he said, he would be in favor of a mandatory recycling program, which he said doesn’t force residents to recycle — it just gives them the option. Councilwoman Pam Humphries said she thinks the public should have a choice but realizes an opt-out option would create extra work. “I see both sides,” she said. One of the council’s main arguments for mandatory curbside recycling is that it would lighten the burden on the Washington County Landfill. Several citizens attended the meeting to voice their opinions on curbside recycling, the majority of them being against it. Resident Don Triptow said that even though he felt like the council had already made up its mind on recycling, he wanted to voice his displeasure with the program, saying recycled plastic is downgraded to make different products than the plastic was originally used for, using the example that old plastic bottles don’t turn into new plastic bottles. He said his family doesn’t generate enough recyclables to make the program worth it. “Please don’t tell me I have to put another bin on the streets,” he said. Resident Ron Kelsey said he is “totally opposed” to curbside recycling because it will create extra work and effort that will be more trouble than it’s worth, and that people who want to recycle can just go to the bins already available around town. Resident Cheryl Reeve said she is against mandatory recycling, saying those who want to recycle have already been doing it for years. Reeve was also concerned that it would require rinsing items out and that the truck would pick up the recyclables on a different day than the garbage. Mayor John Bramall said residents wouldn’t have to rinse items out, and City Attorney Fay Reber said the recyclables would be picked up the same day as the trash, just every other week instead of every week. Kevin and Daphne Thomas also came to voice their concerns over mandatory recycling. Daphne Thomas said it will be a hassle for the city just to hear the complaints about mandatory recycling. “You’ll have a happier community if they have a choice to opt in or out,” Daphne Thomas said. Hurricane Planning Commission Chair Ryan Cashin, who said he came to speak as a citizen and not in an official capacity, was the only Hurricane resident to voice his approval of mandatory curbside recycling, siding with the council that it would decrease the burden on the landfill. Cashin acknowledged the bins around town to which residents can bring their recycling, but he said sometimes he has gone to put recyclables in the bins and they’ve been full, and items meant for the bin have been blowing around. He said he favors eliminating the bins and switching to curbside recycling because it will prevent potential recyclables from become litter. He also debunked fears that the cost for the program was a tax, as some residents felt it was. Instead of a tax, it is a cost for service, he said. Curbside recycling will cost each household an extra $3.82 per month. “Overall, it will benefit the community as a whole,” Cashin said. Washington County Solid Waste District Manager Neil Schwendiman told the concerned residents that the contract for curbside recycling is only for five years. After the contract is up, he said, the solid waste district will assess the program to see if it is still worth continuing; for instance, ensuring there is still a market for the recyclables. If the city chooses the opt-out option, Reber said, it could add more to the fee to cover the increased administrative costs. Councilman Kevin Tervort said that would make the opt-out option more feasible, but that the city would have to specify what the opt-out rules are. Reber said Washington City and St. George favor the opt-out option, and if Hurricane chose that option, the city could wait to see what the other two municipalities decided to do first. After Reber’s comments, Councilwoman Ethelyn Humphries, who attended the meeting via FaceTime, said, “I say we go mandatory and be done with it,” and then made a motion in that direction. Ethelyn Humphries, Larson and Tervort all voted in favor of mandatory recycling, while Pam Humphries voted against. Councilman Darin Thomas was not in attendance. After the vote, Reber said the program would start on Jan. 1 and that residents would need to be alerted about the program and that public hearings would take place. Hurricane Victim Services Advocate Tiffany Mower came to the meeting to tell the council the Hurricane City Police Department has received funding for a “soft” interview room for victims that doesn’t have the police department feel. It will create a “living room setting” for victims of crime to be interviewed where they will feel more comfortable, Mower said. The city also discussed streamlining its parking violation ordinance, which currently has three different code sections. Bramall said he wants to see the ordinances coincide “so they have teeth.” The issue will be discussed further and a decision made at a later meeting. 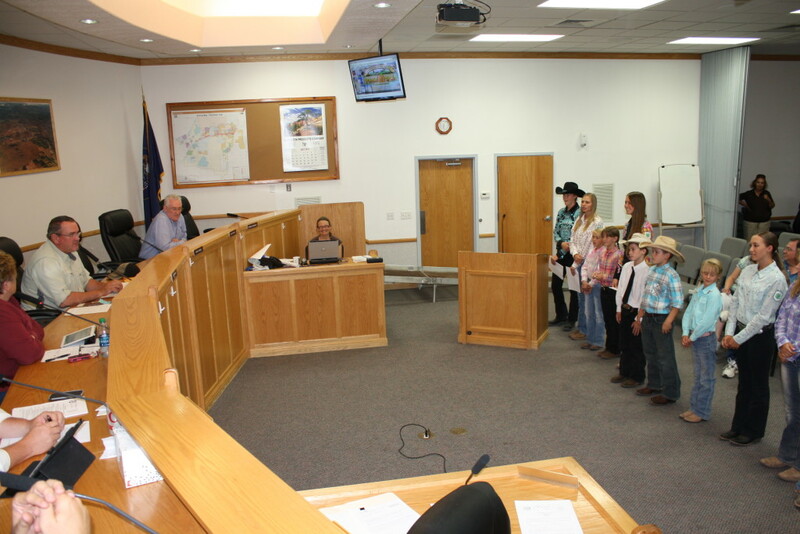 Representatives from Hurricane’s contingent of the 4-H Club came to the meeting asking for the city’s support, through donation of ambulance services, for the Utah State 4-H Horse Show. The show is scheduled to be held Sept. 24-26 at the Washington County Fairgrounds, and 24 Washington County Youth will participate. Kathie Iverson, 4-H adviser, said that by supplying the ambulance, the city and Fire District would become Gold Sponsors and their logos would be put on T-shirts, they would receive a full-page advertisement in the event program, and their names would be placed on banners found at the event. The council unanimously approved its support of the event. In the council and staff reports portion of the meeting, Larson said the joint meeting of the council and planning commission to discuss the city’s vacation rental ordinance has been moved to Aug. 13 at 5 p.m. in the council chambers. Larson also brought up that the planning commission has granted a height variance for a new hotel slated to be built next to Dairy Queen, allowing it to be 52 feet tall — four stories. After Larson brought up the hotel, he and Bramall voiced their concerns over the impact fees associated with it; for instance, there will be an $89,000 impact fee for Ash Creek Special Services District to connect the facility to the sewer when it is only $10,000-$15,000 in other municipalities within the county. Both recommended that the city lower the fee and set rates that are more competitive. Larson said such high impact fees dissuade investment in Hurricane, saying Durangos Mexican Grill paid approximately $33,000 two years ago, and there hasn’t been a hotel built in town for 15 years. Bramall said the the issue will be discussed in the next City Council meeting and that he wants the city to be more business friendly. Also in the council and staff reports portion, Tervort assured the council and residents that something is being done about the mosquitoes, which several residents have been complaining about. He said mosquito abatement is out at night trying to get the mosquito problem under control. “Now everyone knows why we need mosquito abatement,” Bramall said. I was under the impression that the public was going to have the opportunity to vote on whether the City will be going to mandatory recycling. Yes, I know it has been said there is an opt-out choice available. But why is it that when some issue arises, people have to opt out that disagree with it instead of those that want a service or decision to opt in! Why with the room, as reported, full of people against mandatory recycling our counsel members still passed it? Aren’t they elected to represent the public? While I’m on a roll, a four-story motel next to Dairy Queen! Man that will so fit in with the rest of the State street buildings and decor. Aren’t we so lucky! It appears to me that those opposed to recycling are those that continue to ignore the threat of pollution to our planet. We are a nation of trash, and those who refuse to or just ignore the reports via media about how plastic alone has damaged our environment that it will take decades to repair. I support the City Council in voting to begin this program…..it’s unfortunate that a few continue to balk at what we really need to do to help out….I can only hope that those that wish not to recycle remember that it’s our generations to come that will suffer….